The aeroelastic behaviors of wing–pylon–store system have been researched for several decades. However, the effects of pylon–store system on the nonlinear aeroelastic characteristics of slender wings have not been sufficiently understood. In this paper, the nonlinear aeroelastic properties of a slender wing with a pylon–store system are discussed. The nonlinear equations of motion about the wing–pylon–store system are established, where the nonlinearities about the wing deformation and store motion are considered. The aerodynamic loads on the wing are determined by using two aerodynamic models with strip theory. One is the linear unsteady aerodynamic model based on Wagner function, the other is the nonlinear ONERA aerodynamic model. 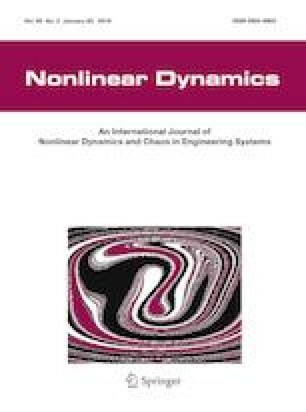 By comparing the nonlinear responses obtained with different aerodynamic models, it is found that the interaction between the aerodynamic nonlinearities induced by dynamic stall and the structural nonlinearities may simplify the bifurcation diagram structure of the system. For some typical cases of the wing–pylon–store system, the aeroelastic responses are analyzed. It is observed that the store-induced kinematic nonlinearities may affect the bending oscillation equilibrium position of the wing. This effect will be reduced by using soft spring in the pylon. Additionally, in the case of pylon with soft spring, the limit cycle oscillation (LCO) onset velocity and the post-critical response peak of torsional motion are insensitive to the store mass center position. But the post-critical response of store pitch is violent if the store mass center is not under the elastic center. In the case of pylon with hard spring, the post-critical response of store pitch becomes very complex. Though the response peak of the store is small, the LCO onset velocity changes obviously with the variation of the store mass center position. The store-related kinematics will play an important role on the nonlinear responses of the system in this situation. This work is supported by the National Natural Science Foundation of China (No. 11472089).